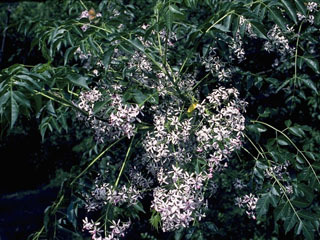 Description: Deciduous tree to 50 feet (15 m) in height and 2 feet (60 cm) in diameter, much branched with multiple boles, lacy dark-green leaves having a musky odor, and clusters of lavender flowers in spring yielding persistent, poisonous yellow berries. US Habitat: Common on roadsides, at forest margins, and around old homesites but rare at high elevations. Semishade tolerant. Forms colonies from root sprouts or sprouts from root collars, and spreads by bird-dispersed abundant seeds. US Nativity: Introduced to U.S.
Management: The most effective chemical controls are cut-stump and basal bark applications of triclopyr herbicides. Cut trees left untreated will grow back with several branches emanating from a single stump. Removal of seedlings must include the entire root system.